Is your summer galloping by too fast? It’s not too late to slow things down. Check out 9 simple ways to help you enjoy a slow summer with your kids this August. Somehow I always think there will be more time in the summer. Summer days in Northern Canada are long and full of light. Somehow that fools me into thinking that I actually have more time. More time for enjoying the outdoors in the summer; plenty of time to spend with family and loads of time to build memories. But all of sudden we are seeing the dreaded back to school sales and next week it will be August! What? How did that happen? Officially we’ve still got a month left of summer, but I’m already starting to see signs that we are moving towards fall. Still when I went for my morning walk today the birds were singing, my garden is blooming, and the mama deer have emerged from the bush with their spotted fawns to graze on the greenery. Now is the perfect time to banish busy and enjoy a slow summer with your kids while you still can. Banish the perfection monster, lower your standards—it’s good enough for today. Trade the perfection crazies for slower peaceful days. Resist the compulsion to get “one more thing” ticked of that pesky to do list—instead enjoy one more chapter of your book, making mud pies, or one more run through the sprinkler. When things don’t turn out as planned- LET IT GO. It is not a reflection on your worth as a parent. Sometimes what happens instead turns out to be far better anyway. Run through the sprinkler. Roll down a grassy hill. Blow bubbles. Enjoy a water fight with your kids. Play and have fun! Take the time to notice butterflies, the brilliant hues of flowers, the glowing fireflies, and the sweet taste of peaches. Give thanks for all these summer treasures out loud, so your children will begin to notice them too. Simplify, simplify, simplify- enjoy simpler meals, pare down your schedule, and cut down on the number of extra activities. Enjoy some simple pleasures like making daisy chains, skipping rocks across a pond, or stuffing your faces with wild berries. Remember this is the only summer your child will be (insert age). Treasure the special moments with your children. Have a campfire cookout or make some frozen treats! Are you happy with the summer activities so far? Do they make your family life more fun and? If not, consider letting them go and trying something your kids will really enjoy. 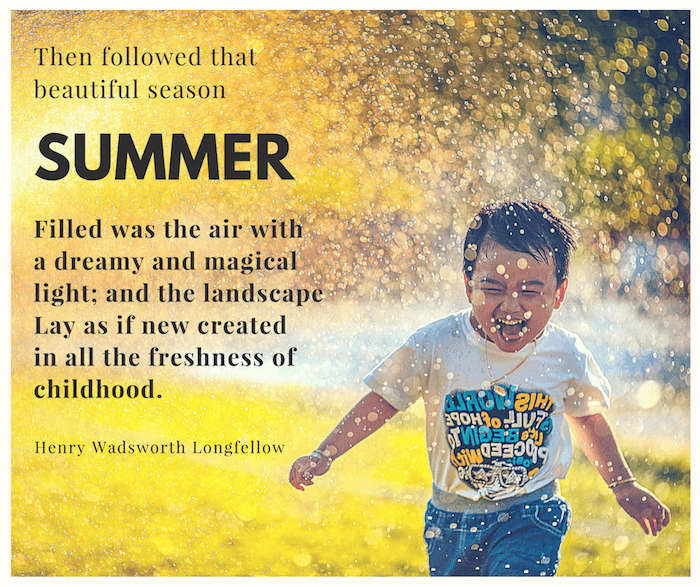 When summer really draws to a close, let’s be filled to the brim with summer goodness so that we can really appreciate the arrival of cooler weather. It’s not too late to savour the season or build those summer memories. What about you? Tell me what you enjoy most about summertime. What special summer moments have you shared with your family this year? How do you slow summer down and savour the season? Check out my Summer Play and Outdoor Fun board on Pinterest. Good Morning! Love this post. Yes, I too am surprised it is already August. Time just seems to be going by way too quickly these days. Your post and suggestions brought back pleasant memories of childhood. I miss doing those simple things! One of my favorite things about summer is, of course, the warm weather! I also find there is a sense of freedom and excitement during the summer months. Thank you for these reminders and suggestions. I had a similar childhood and in my memory the summer days stretched on forever. I’m trying to recapture that sense of timelessness! Yes, it’s winter where I am but we have been blessed with lots of sunny days. I think I could still apply almost all of your beautiful suggestions Sharon and it’s the weekend here, so time to get off the computer and put some into practice! I LOVE this! I think some families get too caught up in summer bucket lists and all the craziness that they forget to relax. My favorite time in the summer growing up was the 2 weeks when we had NOTHING going on. No little league, no sport camps, no vacation. Just hanging, relaxing and enjoying the summer. Now if only my oldest would feel the same way!! Great post. Thanks for sharing. I think that many families feel a lot of pressure to make an incredible summer for their children and it all gets too much. I found that the simplest pleasures are the things my boys remember. Thanks for popping by to visit!